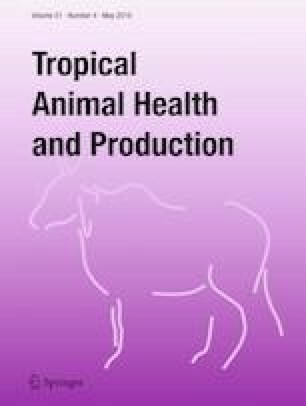 African animal trypanosomiasis is a major cause of mortality and economic losses for the livestock industry in Nigeria. Chemotherapy has been the most reliable option for cattle herders, and the most commonly found drug on the market is diminazene aceturate. To ascertain the long-term efficacy of this compound, we sampled a cattle herd in Ogun State, Nigeria, 2 months after they were treated with diminazene aceturate. The ITS-PCR results revealed 19 positives for trypanosome DNA out of the 79 samples tested (24.1%, 95% CI 16.0–34.5). Seventeen out of the total 19 positives were Trypanosoma congolense (21.5%, 95% CI 13.9–31.8). Mixed infections were also observed. Therefore, the persistence of bovine trypanosomiasis at this Nigerian cattle farm despite treatment could be due to diminazene aceturate resistant trypanosomes being present in the herd. is a chelating material used to purify other compounds via ion exchange. It has the ability to bind transition metal ions. It was used to elute DNA from the FTA cards. We appreciate staff and management of CPV, Federal University of Agriculture, Abeokuta. Nigeria. Special gratitude to Professor Adejinmi J. O. for his financial and moral support. This study was financially supported by Commonwealth Scholarship Commission and The University of Edinburgh, UK. Paul O. Odeniran is a Commonwealth scholar, funded by the UK government with reference number NGCN-2016-196. The University of Edinburgh is a charitable body, registered in Scotland, with registration number SC005336. The study was conducted with the permission of the University of Ibadan Animal Ethics Committee (UI-ACUREC/App/12/2016/05) and in line with the guidelines of the committee.